You are currently browsing articles tagged cooking. This is a yours truly mash-up of two classics—New England brown bread and bread pudding. Brown bread is traditionally made with equal parts of wheat, rye and cornmeal, sweetened with molasses, and then steamed in a can, rather than baked, producing a satisfyingly rich but moist loaf. Bread pudding is made all over the world of course. A mixture of milk, eggs, sugar and spices are poured over stale bread and baked into a homey dessert. I’ve never heard of anyone else doing this but I make bread pudding using brown bread. Here’s a little history and arecipe for brown bread from Epicurious, or you can do as I do and buy a can of B&M Brown Bread, made right here in Maine. My first experience with brown bread was through a care package from my mother-in-law when we were living in Oklahoma. I learned to love this curious dark bread that came out of a can, we ate it sliced thick and smeared with cream cheese or warm with butter. 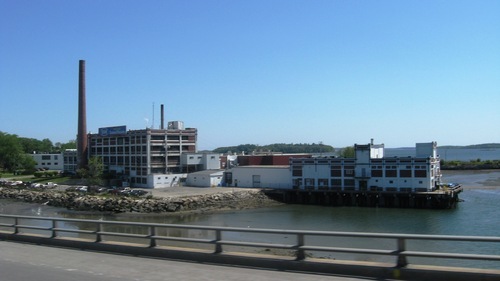 When we first moved to Maine several years later, our first apartment was less than a mile from the old brick factory situated just where the Back Cove meets Casco Bay. We passed by nearly every day and when the wind was right, the scent of baked beans would compete with the salt air. 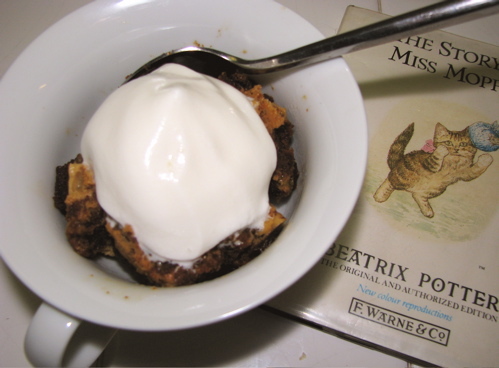 It was several years later when I came up with the idea to make a bread pudding using brown bread. I really can’t remember what inspired me to try it. I sliced the bread thick and cut it into cubes and then toasted the cubes a bit in the oven. Then I dumped the bread into a deep round casserole dish and poured the pudding mixture over it and baked. It was well received by our dinner guests, a thoroughly Maine couple. This past weekend I made a double batch for friends at Camp Gander Brook. Brown bread pudding seemed like a fitting finish for a casual dinner in the lodge, the October chill held off by a warm fire crackling in the massive stone fireplace and the laughter of our children as they played under the old wood-beamed ceiling. Beat all ingredients together except for the bread cubes. In an ungreased 2 quart baking dish, pour egg mixture evenly over bread cubes (and dried fruit). Bake in a 350° oven for 40 to 45 minutes or till a knife inserted near the center comes out clean. Serve warm with a dollop of whipped cream or vanilla ice cream. * If you don’t have cardamom, substitute nutmeg or use a full teaspoon of cinnamon.